The high-altitude environment generally refers to elevations over 1,500 m (4,800 ft). Moderate altitude, 2,000-3,500 m (6,400-11,200 ft), includes the elevation of many US ski resorts. Although arterial oxygen saturation is well maintained at these altitudes, low PO2 results in mild tissue hypoxia, and altitude illness is common. Very high altitude refers to elevations of 3,500-5,600 m (11,200-18,000 ft). Arterial oxygen saturation is not maintained in this range, and extreme hypoxemia can occur during sleep, with exercise, or with illness. HACE and HAPE are most common at these altitudes. Extreme altitude is over 5,600 m. At these elevations, successful long-term acclimatization is not possible; in fact, deterioration ensues. Individuals must progressively acclimatize to intermediate altitudes to reach extreme altitude. Hypoxia is the primary physiological insult on ascent to high altitude. 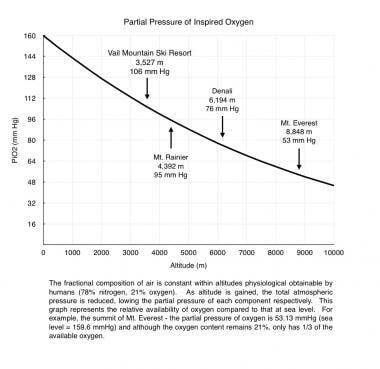 The fraction of oxygen in the atmosphere remains constant (0.21) at all altitudes, but the partial pressure of oxygen decreases along with barometric pressure on ascent to altitude. The inspired partial pressure of oxygen (PiO2) is lower still because of water vapor pressure in the airways. At the altitude of International Airport at La Paz, Bolivia (4062 m; 13,327 ft), PiO2 is 98.18 mm Hg, which is equivalent to breathing 12.8% oxygen at sea level. See the image below. The response to hypoxia depends on both the magnitude and the rate of onset of hypoxia. The process of adjusting to hypoxia, termed acclimatization, is a series of compensatory changes in multiple organ systems over differing time courses from minutes to weeks. While the fundamental process occurs within the metabolic machinery of the cell, acute physiologic responses are essential in allowing the cells time to adjust. The most important immediate response of the body to hypoxia is an increase in minute ventilation, called the hypoxic ventilatory response (HVR), and is triggered by oxygen sensing cells in the carotid bodies. Increased ventilation produces a higher alveolar PO2. Concurrently, a lowered alveolar PCO2 produces a respiratory alkalosis, acting as a brake on the respiratory center of the brain and subsequently limiting further increases in ventilation. Renal compensation, through excretion of bicarbonate ions, gradually brings the blood pH back toward normal and allows further increase in ventilation. This process, termed ventilatory acclimatization, requires approximately 4 days at a given altitude and is greatly enhanced by acetazolamide. 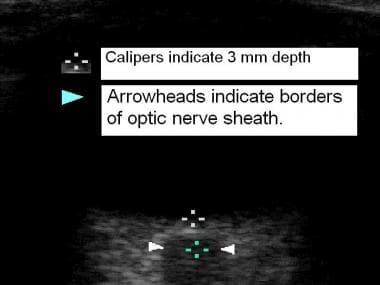 Patients with inadequate carotid body response (genetic or acquired, eg, after surgery or radiation) or pulmonary or renal disease may have an insufficient HVR and thus not adapt well to high altitude. In addition to ventilatory changes, circulatory changes occur that increase the delivery of oxygen to the tissues. Ascent to high altitude initially results in increased sympathetic activity, leading to increased resting heart rate, cardiac output, and mildly increased blood pressure. Within minutes of exposure, the pulmonary circulation reacts to hypoxia with vasoconstriction. This may improve ventilation/perfusion matching and gas exchange, but the resulting pulmonary hypertension can lead to a number of pathological syndromes at high altitude, including HAPE and altitude-related right heart failure (see, Altitude Illness - Pulmonary Syndromes). Hemoglobin concentration increases after ascent to high altitude, thereby improving the oxygen-carrying capacity of the blood. Initially, it increases as a result of hemoconcentration from a reduction in plasma volume secondary to altitude diuresis and fluid shifts. Subsequently, over days to weeks of hypoxia exposure, erythropoietin stimulates increased red blood cell production. In addition, the marked alkalosis of extreme altitude causes a leftward shift of the oxyhemoglobin dissociation curve, facilitating loading of the hemoglobin with oxygen within the pulmonary capillary bed. Sleep architecture is altered at high altitude, with frequent arousals, and nearly universal subjective reports of disturbed sleep. This generally improves after several nights at a constant altitude, though periodic breathing (Cheyne-Stokes respiration) remains common above 2,700 m. The use acetazolamide has been demonstrated to reduce the symptoms of high altitude sleep disturbance. Susceptibility to AMS demonstrates great individual variability because of genetic differences. Individual susceptibility is reproducible; a past history of AMS is the best predictor. Rapid ascent to altitudes greater than 2,500 m can cause AMS. Continued ascent despite symptoms of AMS is a major risk factor for developing HACE. At altitudes over 5,000 m, ascents of as little as 200 m for individuals with moderate AMS have precipitated HACE. The incidence of AMS varies depending on the rate of ascent and the maximum altitude reached. In moderate altitude (2,000-3,500 m) ski resorts, the incidence ranges from 10-40%. Rapid ascent to approximately 4,000 m has been associated with incidences of 60-70%. Travelers flying to a high altitude destination such as Lhasa, Tibet (3,810 m; 12,500 ft) or La Paz, Bolivia (4,062 m; 13,327 ft) can expect an AMS incidence of 25-35%. In those who hike above 4,000 m (and so ascend at a moderate pace), 25-50% will suffer from AMS. HACE is estimated to occur in about 1% or less of persons traveling above 4,000 m and in 1-3% of those with AMS. The prognosis is excellent for AMS and for survivors of HACE; reascent with caution is acceptable after patients have completely recovered (ie, are fully asymptomatic). It is common for climbers to develop AMS, descend slightly, and 1 or 2 days later (after resolution of their symptoms) continue their ascent. The natural history of AMS varies with altitude, ascent rate, and other factors. In general, the illness is self-limiting and symptoms improve slowly, with complete resolution in 1-3 days without treatment. However, with continued ascent, AMS is very likely to worsen and is more likely to progress to HACE. HACE may progress to stupor and coma over hours to days if untreated. Once coma has developed, death is more likely despite aggressive treatment; death is due to brain herniation. The usual course is rapid, complete recovery if descent is immediate and treatment is started promptly. Slower recovery results when treatment is delayed. In rare cases, patients with either severe or prolonged HACE may have persistent neurologic deficits. Ataxia commonly persists for days to weeks and is often the last finding to resolve. Educate patients on staged ascents (see Prevention) and on the golden rules of altitude illness. If you feel unwell at altitude, it is altitude illness unless proven otherwise. If you have symptoms of altitude illness, go no higher. If your symptoms are worsening, fail to improve with treatment, or if HACE or HAPE are present, descend immediately. For patient education resources, see the article Altitude Sickness.